Today, as I was intuiting a new friend as support for a beautiful soul and taking photos to send so she could start connecting with her while she is still in creation, I was just overtaken with the energy and amazingness they all naturally possess. Every crystal is beautiful and unique, so perhaps its just my expanding heart that is getting overwhelmed by this new family of 30. I was telling my friend and co-creative business partner, Allison, they’re driving me bonkers (in a very good way). She said, “You already are!” LOL! I thought I would share a preview of what the 30 of these Lemurians are like, by posting photos of this sweet and lovely little one (she’s the tiniest of the family too! But gorgeously packs a punch!) She is a taste of what this collective group is ALL like! Stunning! I am more than happy to send photos of your little one you desire me to intuit for you, or you can allow for complete surprise! The new Lemurians will be ready to ship out in about 2 weeks or less. I will let you know when they are ready to ship, which could be sooner, but I’d rather come in early on them than late! I’ve had such an amazing, beautiful, flowing and deep journey with my newest painting. I followed the guidance I was receiving, as to what would be next and there were so many signs all around that pointed me energetically and literally to where that was. 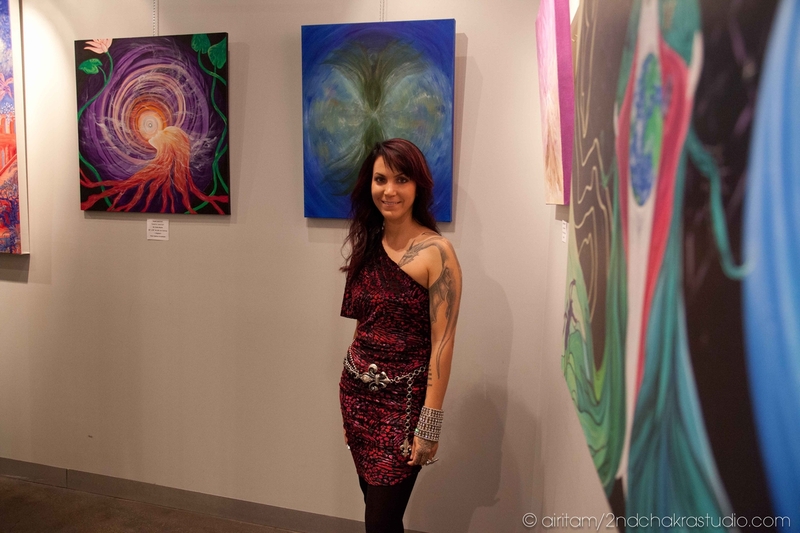 I love how there just is no thought process involved anymore, and it all is simply about unleashing the trust in my heart to bring forth the channeled image that wants through – even the title of the paintings immediately come in crystal clear before I even start them, while I am receiving the vision in my my mind’s eye. This is one of those times I wish I had a professional photograph or scan to share, but these photos will have to do in helping to convey the energy. The colors are so rich in person and different in shade, and the ethereal detail really takes flight when lit by just the right lighting. As a Pisces and with a strong connection with the energy portrayed here, I felt quite at home in the visions manifested. Having been surrounded by Larimar energy, my Quartz crystal skull, a new lively and stunning batch of 30 Lemurian Seed Crystal L.O.V.E. Seeds, my finalized magic dragon tattoo just newly healed, and profound shifts (yes again and big time!) it all has proven to be very supportive and opening for what was to come through with this painting. 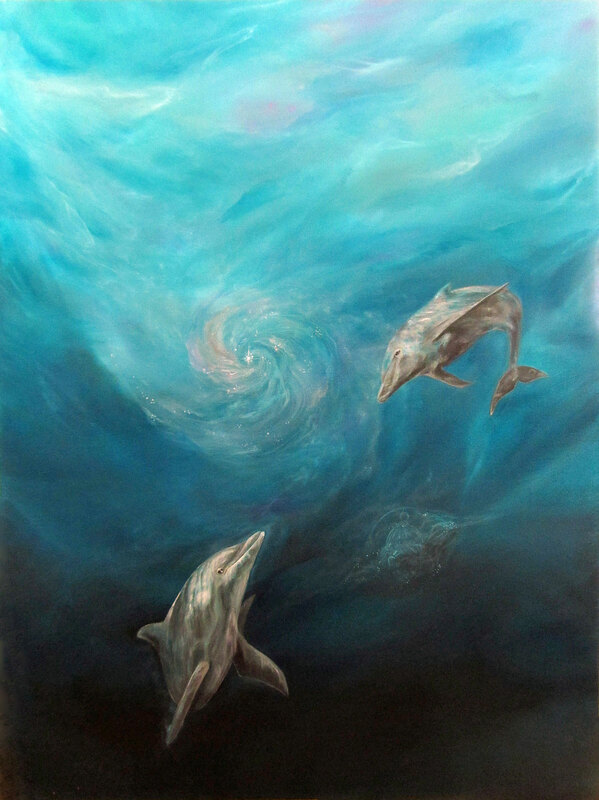 The title is, “Visions of Atlantis,” and I’ll let its energy speak for itself. What I can say is that when I first began painting the water depths and energy movement of it, I experienced deep Root Chakra/tailbone intensity (triggering my injury of a fracture to it several years ago) and as I completed it today, (finalizing the Nautilus-like underwater vortex and emerging bubble orb with Atlantean temple inside) big time Crown Chakra head energy…quite a complete journey of integrated healing. 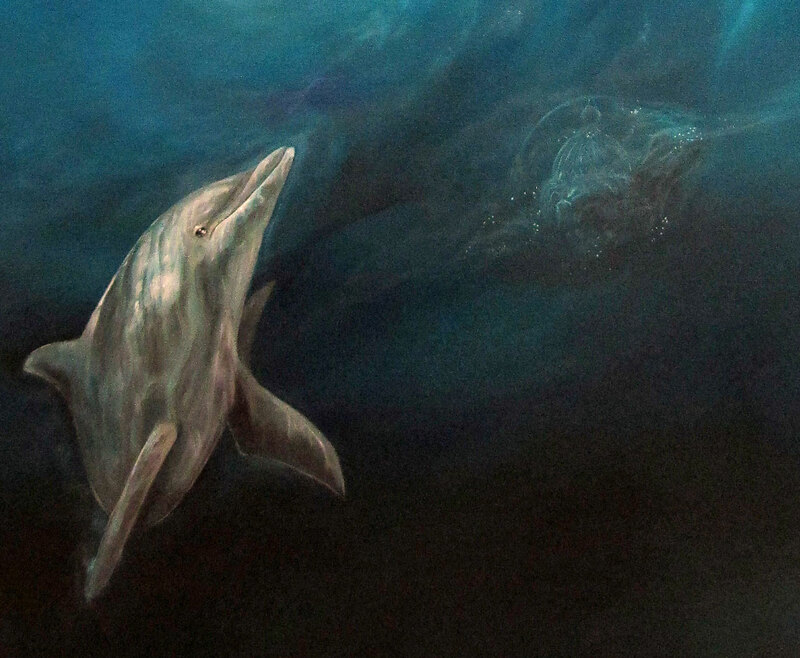 The experience of, and the literal painting of this piece, was such a profound contrast to my painting, “Water,” from the In Lak’ech series, which was at a very different place in my and the collective’s healing journey with ancient Atlantis and Lemuria. Needless to say, I am in love with this painting – it is very dear to me in many ways and its timing is sooo synchronous and divine. I just received word, as I was painting it, that the Bimini Reiki retreat I have mentioned I was likely going to be offering IS to take place this summer. 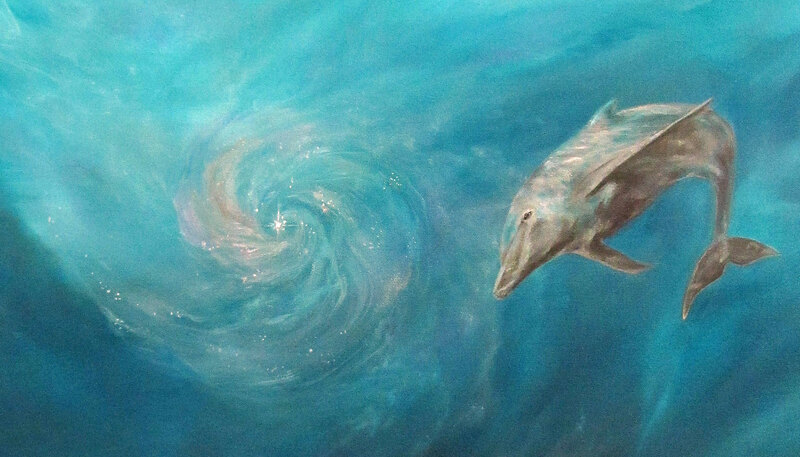 Dolphins, Atlantean energy and more! 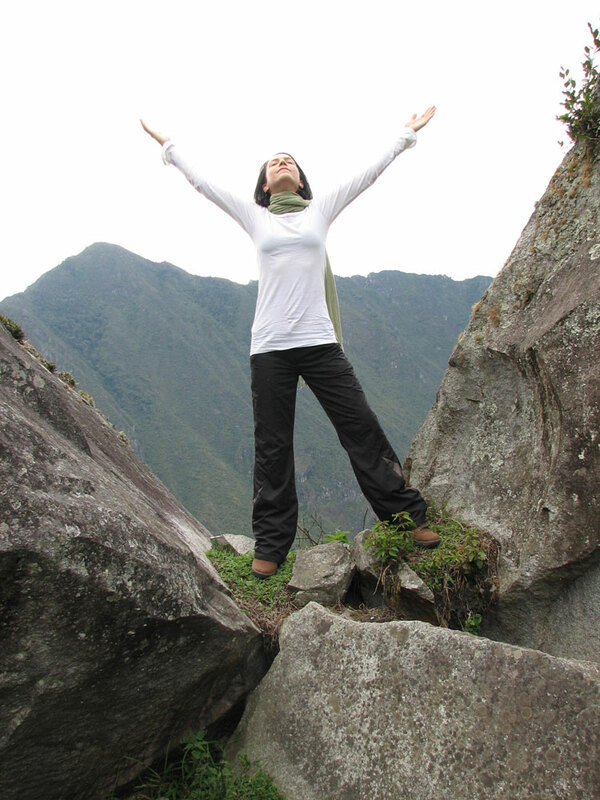 All the exciting details for this empowering healing journey will be posted here shortly in the next couple of days. Until then, wishing you sweet dreams filled with “Visions of Atlantis” Love! As one family of Lemurian L.O.V.E. Seeds travels off to their new and loving homes, a new family begins their journey. Pictured left is the last of the Lemurians from the first family unit that remains. 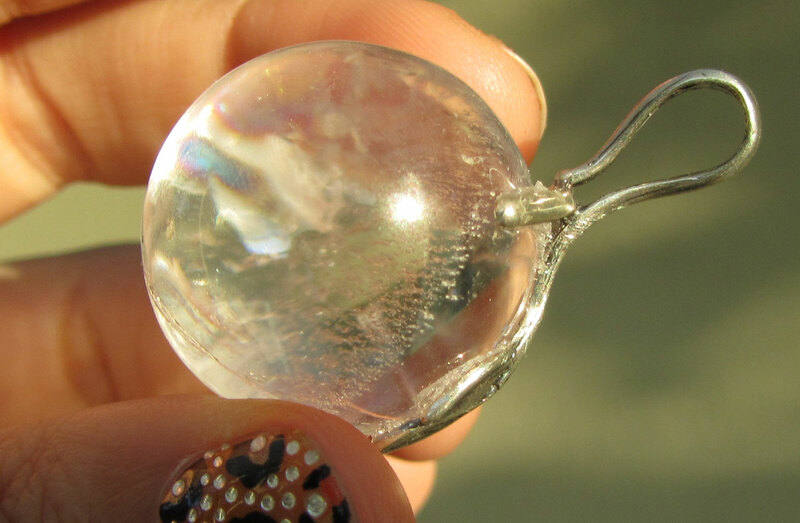 He is one of the largest of the sizes of spheres (at 15/16″ in diameter – nearly 1 inch!) holding stoic anchor for his group and has a gentle mystique. Reminds me of the story from which the phrase “The Last of the Mohicans” came to be, which is used oftentimes proverbially to refer to the sole survivor of a noble race or type. Lemurian L.O.V.E. Seed #6 patiently awaits connection with his new companion in life. They know who they are here to connect with and wait for divine timing to create that beautiful conjunction. In the meantime, the second large family of Lemurian L.O.V.E. Seeds (30!) 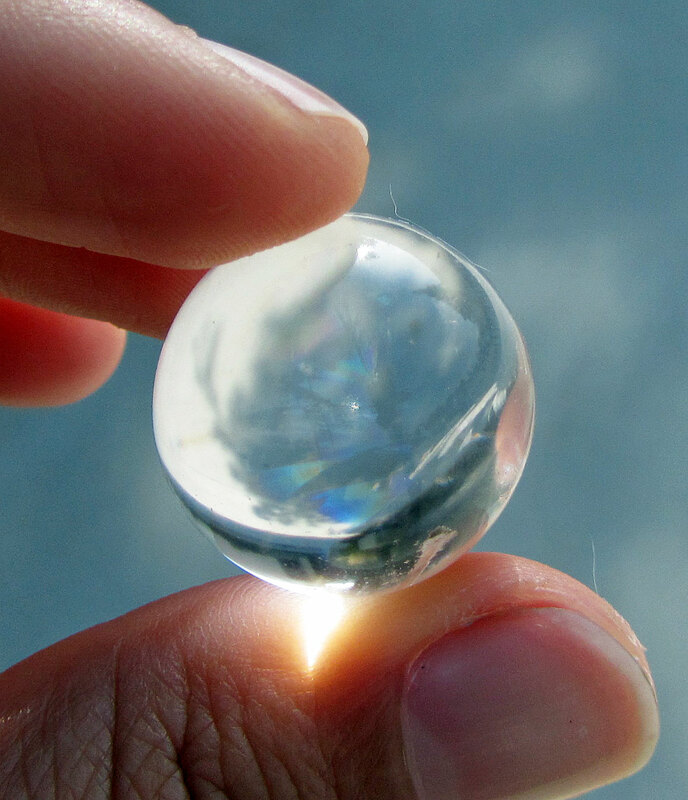 have become active and are being introduced in their stages of development (pictured below in their unit that is part of the collective Lemurian energy). Can you say AMAZING?! If you’re sensitive to energy, I think the photo speaks for itself about the energy of this group. Spectacular, stunning, breathtaking, potent…..just some of the words that come to mind when I view and hold them. Their new companions will be awed by them. 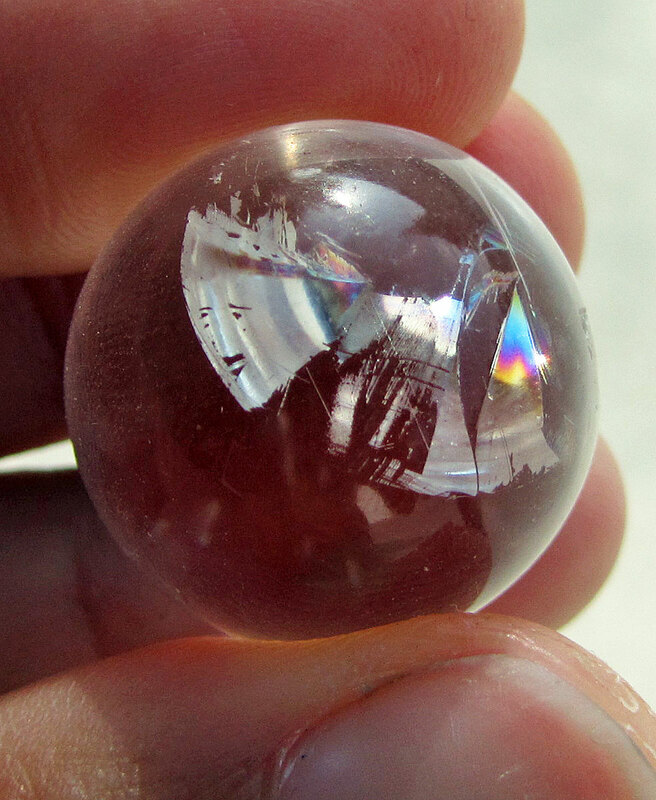 And they have some out of this world inclusions and infusions of energy. As you can see, some wear their personalities and energies dramatically on their sleeve (notice the prominent rainbow at bottom right, along with hints of rainbows peeking out in the rest of the group). Others like to reveal them in time and when they are ready. Your heart will skip a beat when each of these are captured individually either by me on camera, or by you in person, as you explore them in the beautiful dance of sunlight. I will do my best when sharing, to explain the energy and physical attributes each has, but let their images do most of the talking. I have a sense one of these 30 beauties may be staying with me. As I work with them, much is revealed. I am following guidance on how to approach each. They may be introduced in completion, one at a time. Maybe as a group. Or, I may not finalize their creation until they have connected with their new companion either through connection from posting them individually, or if you ask me to intuit one for you and then I’ll create from scratch. However it unfolds always is perfect and the happy stories people have shared, have been testament to the divine love that is flowing in relationships between myself, each of these crystalline beings, and the new friends we connect with. 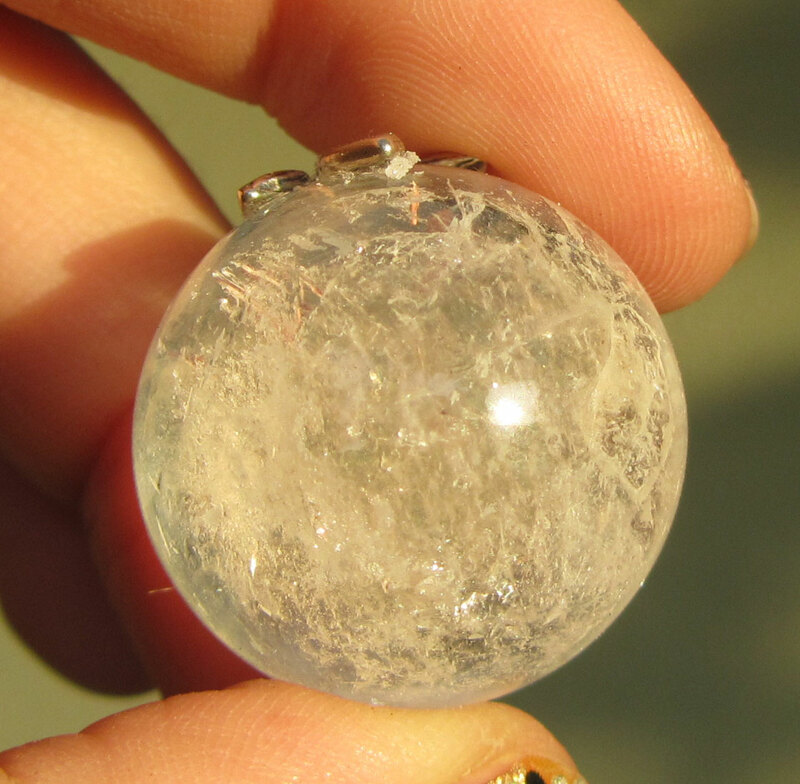 If you’ve ever been drawn to Lemurian Seed Crystals and desired to work with one, these L.O.V.E. 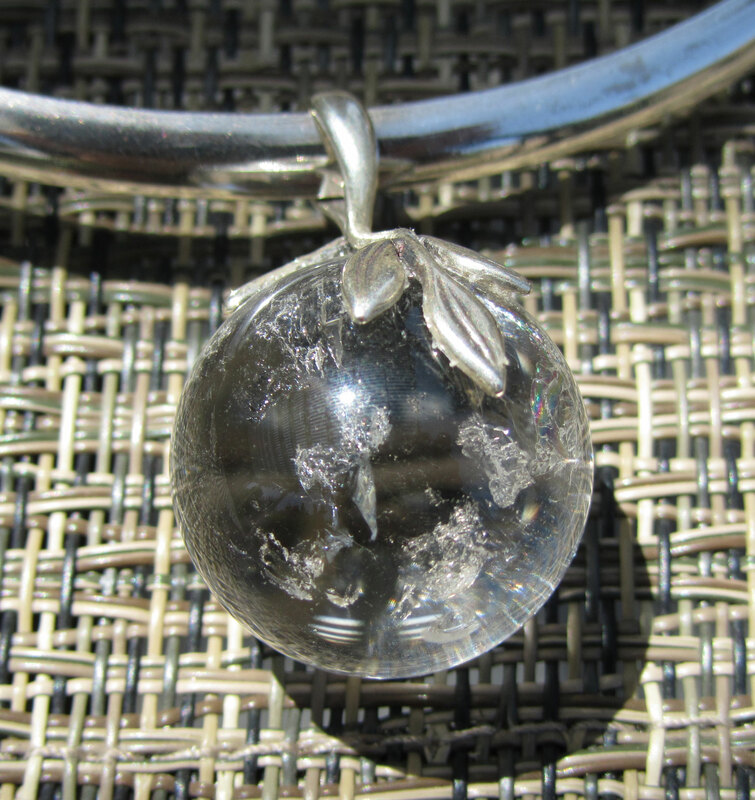 Seed sphere pendants are the perfect companions not only in the loveliness of their energy and support, but also their convenience to easily wear/have with you whenever you want (sitting atop your heart chakra is one place they love), but are also inexpensive gifts to self (or others) to express the self love and value you have for yourself, the Earth and the collective. 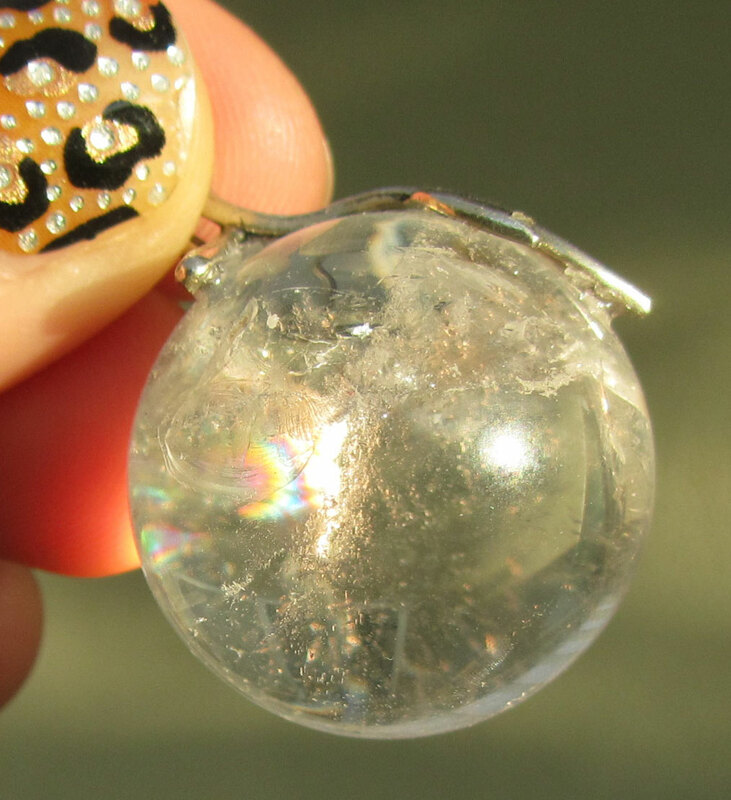 If you are interested in the last Lemurian, #6, you can purchase him here: http://www.etsy.com/listing/99313320/lemurian-seed-crystal-sphere-love-seed. If you would like to order one of the 30 in the new family, please contact me at tania@taniamarie.com for more details. 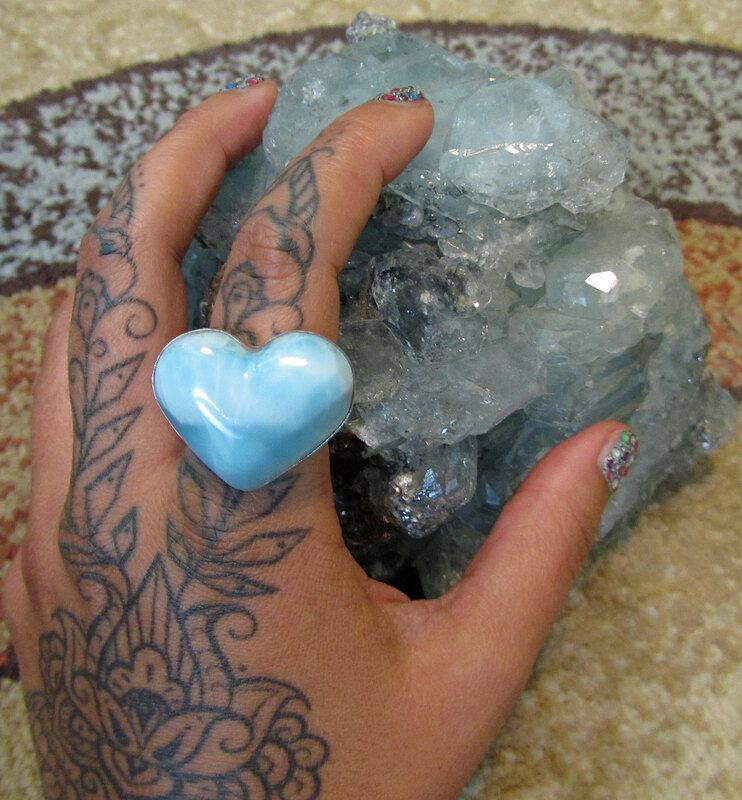 Traveling the Inner Waters of Creation and Healing Love – Larimar Activations for Art and Heart! I have been reconnecting with my Larimar friends lately – they have been one of my top 5 favs for quite a while (revolving back around to #1 when that energy is calling me like right now!) 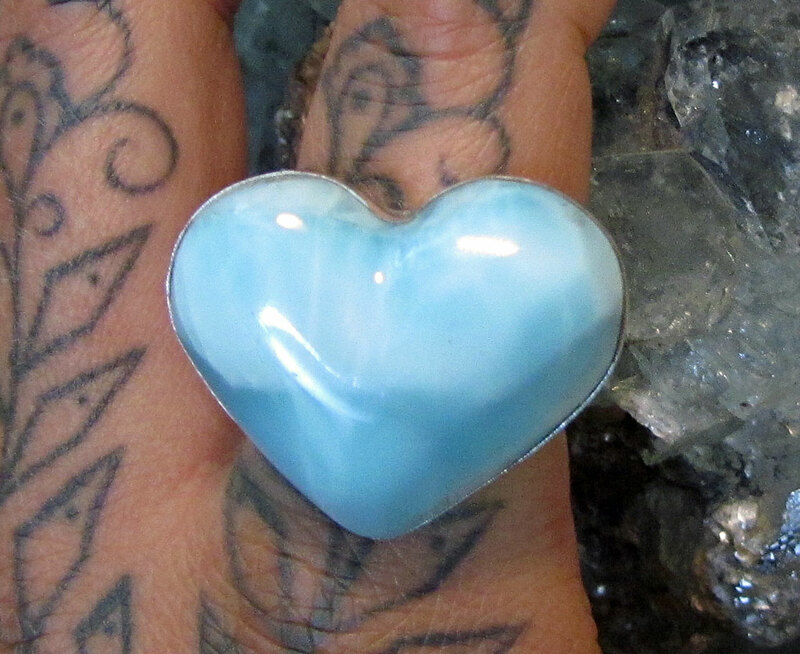 I just recently acquired (and gifted) a new Larimar heart ring to add to my collection of rings and necklaces I have adored wearing. Not only for their stunningly beautiful energy that so feels at home to me, but for their amazingly gorgeous variations, color (aqua – my favorite color since I was a wee one), and vibrational resonance of a special number (another fav since the childhood days). 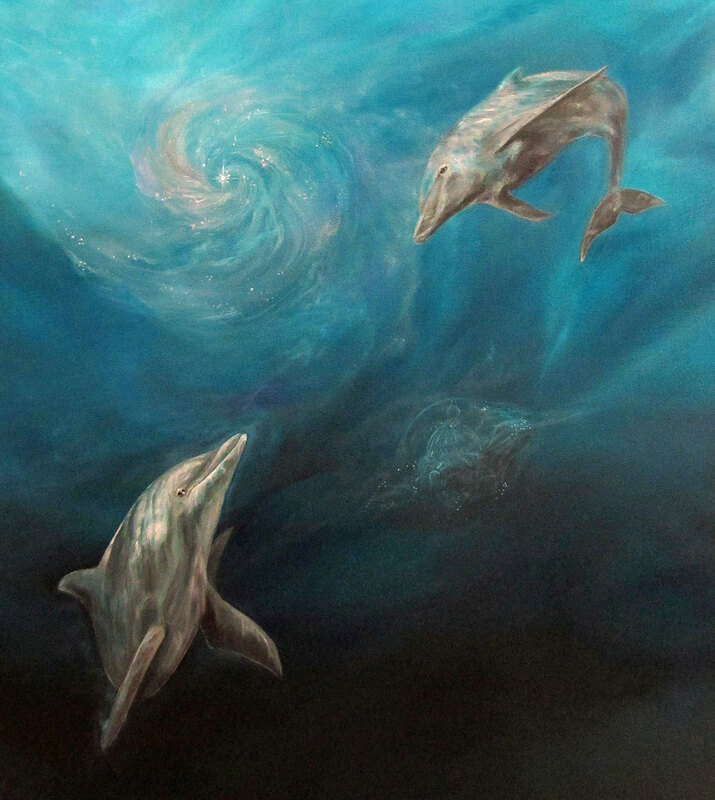 I love how synchronicity is consistently at play, as I’m also currently working on the same vibrational energy with my new painting of dolphin, ocean, Atlantean energy (should be completed in a few days) and have been starting to plan a Bimini Reiki and Dolphin retreat to offer hopefully late this summer. So, yes, my lovely Lemurian friends have taken center stage in assisting the energy. 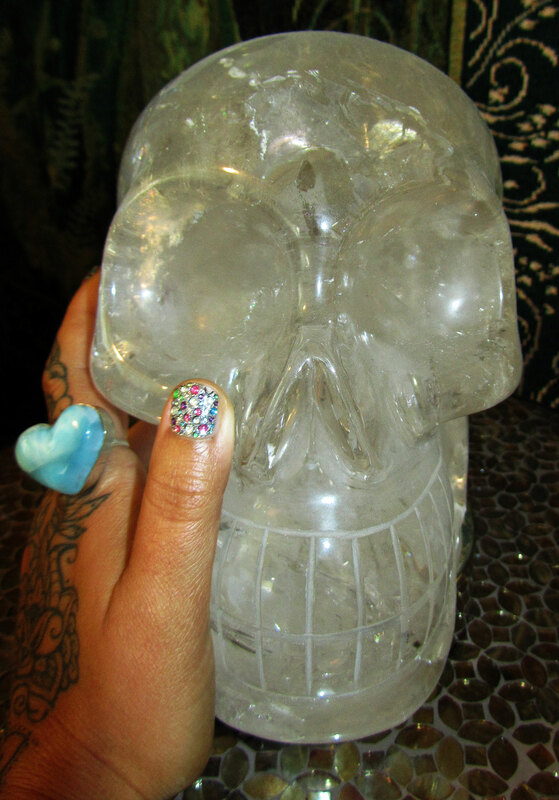 Interestingly though, so has my amazing Quartz skull – Raja Seraphina. She (a balance of female and male energy creating an integrated and strong Divine Feminine Energy) is feeling very active right now and oh how I love her and crystal skulls!! I tried to take a good photo of her, to capture her amazing rainbows (one at the third eye and many in her crown), but no sun was out to do so. But here she is on center stage in my studio sanctuary on her little pedestal and stand that lights up with my Larimar ring again, expressing the love I have for her. She faces my easel where I paint. Anyway, needless to say, I’m traveling in ocean energy currently and yesterday while painting the emotional watery abyss, the depths of energy triggered quite an activation in my Root Chakra that put my injured tailbone, from a fracture several years ago, into a tizzy. My tailbone (amongst other things) has been overly active for the last several months as energy shifts. Rooting and balancing the new energy, as the old receives loving release. For those not familiar with Larimar or who would like to know a little more here are some of the properties to explore and see if the energy calls to you! Opens creativity through the throat chakra, aids and strengthens self-expression, patience, acceptance, gives wearer mysterious ability to communicate and transmit messages, ability to channel healing energies to the Earth, enables one to overcome self-imposed restrictions, helps one to view events from a different perspective, softens, enlightens and heals physically, mentally, emotionally and spiritually, draws one’s soul mate (soul mate stone), heals negative karma between soul mates and lovers, aids clear communication and emotional strength and stability to speak from the heart, facilitates inner wisdom and outer manifestation, balances 3rd eye, crown, throat and heart chakras, provides a strong sense of peace, eases stress and anxiety, calming, brings tranquility of water, sea and air to heart and mind (it is from the Caribbean), soothes and uplifts hurt, fear, depression, pain of life, opens mind in the face of change, supports patience, acceptance, simplicity, creativity, artwork, cools, promotes serenity, relaxes and soothes the emotional body, draws out inflammation, uplifts the heart, radiates healing and love, vibrates numerologically to master number 55 to help access Higher Mind and channeling it through your individuality, is a direct line to the Universal mind and akashic records, it calls upon you to responsibly harness and direct the knowledge that is attainable now and signifies change and responsible choices. Larimar is known as the Atlantis and Dolphin stone, as it helps channel energetic connections with the ancient civilization and also aids communication with sea creatures. 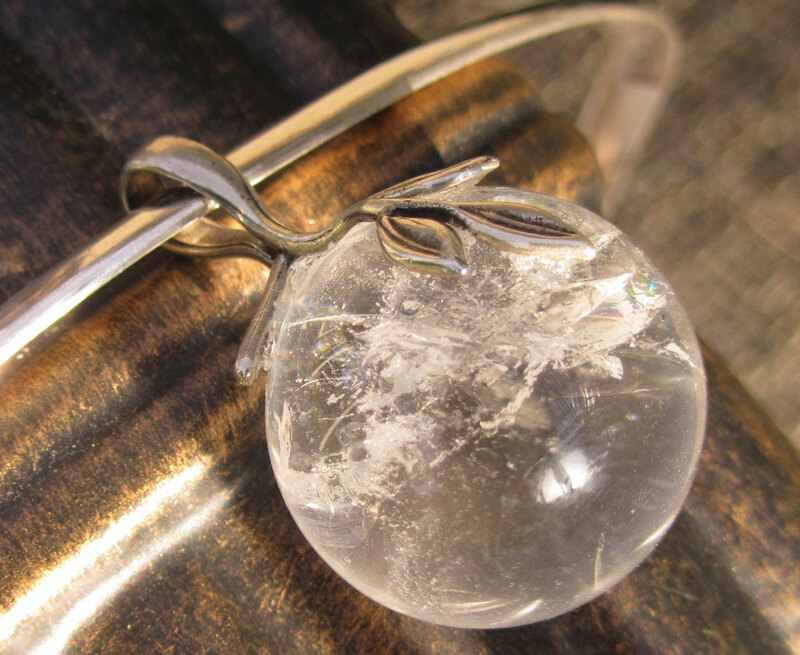 Looking for a lovely Larimar pendant that can support more balance in your life? 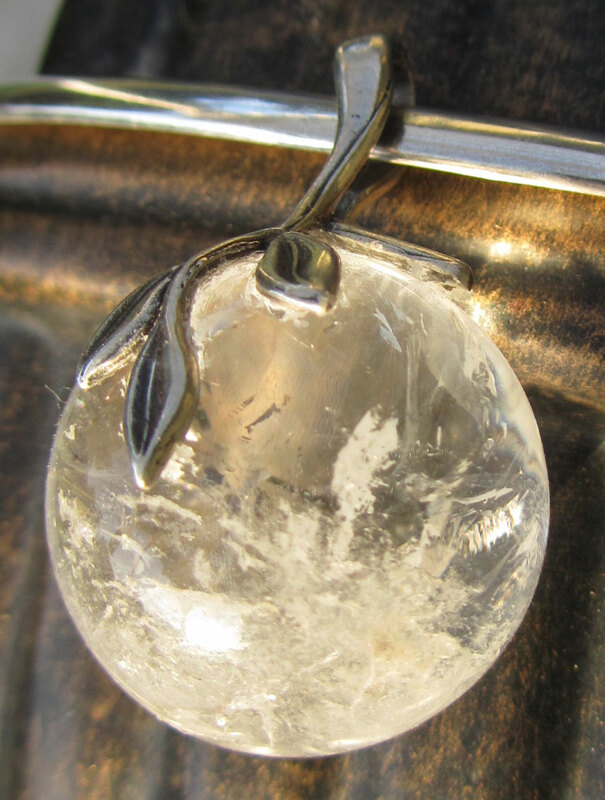 You can commission a custom piece by contacting me at tania@taniamarie.com or check out our collection of crystal pendants at Joyful Earth Crystals to see if another crystal calls to you. 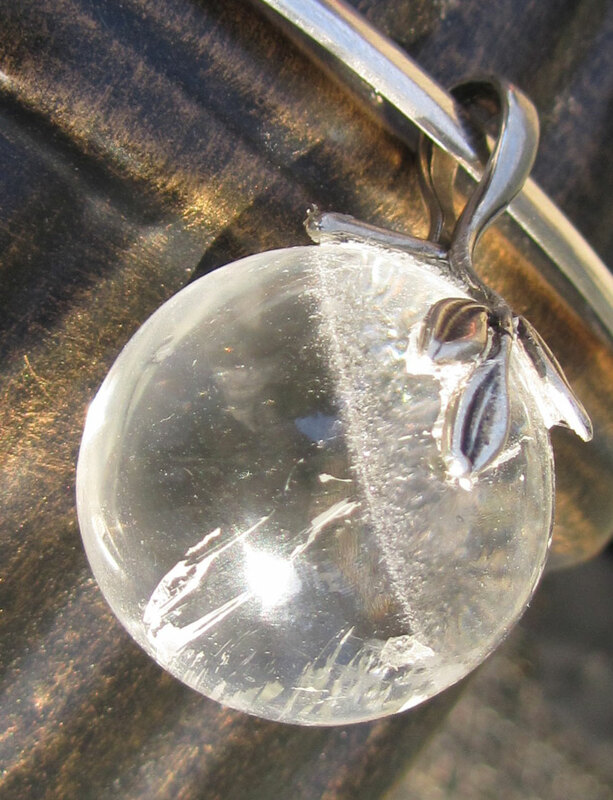 A pendant of any crystal you desire can be created. 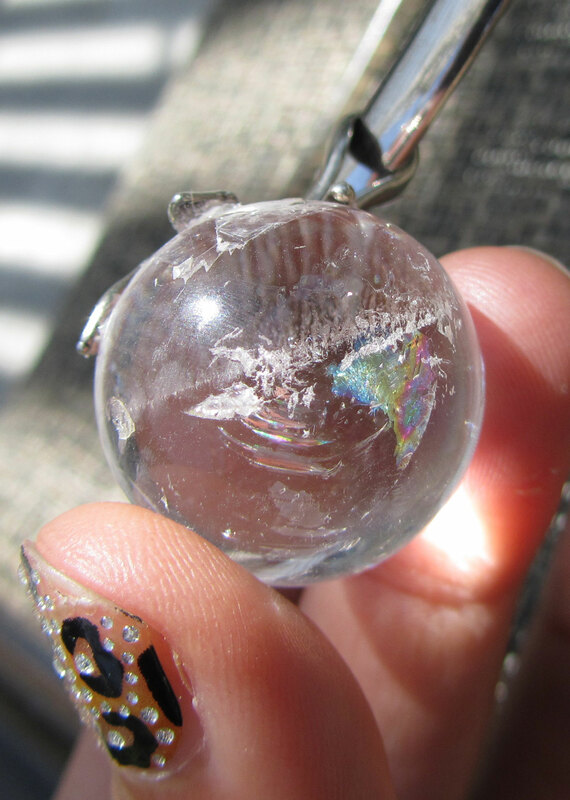 New crystal pendants coming soon! I love the divine synchronicity of timing in how each of these have connected with their new friends. The stories are so beautiful! Some are receiving messages through them before actually connecting, others are being led through signs and messages, and upon receiving, the response is that of stunning and gently powerful loving energy communicating through. 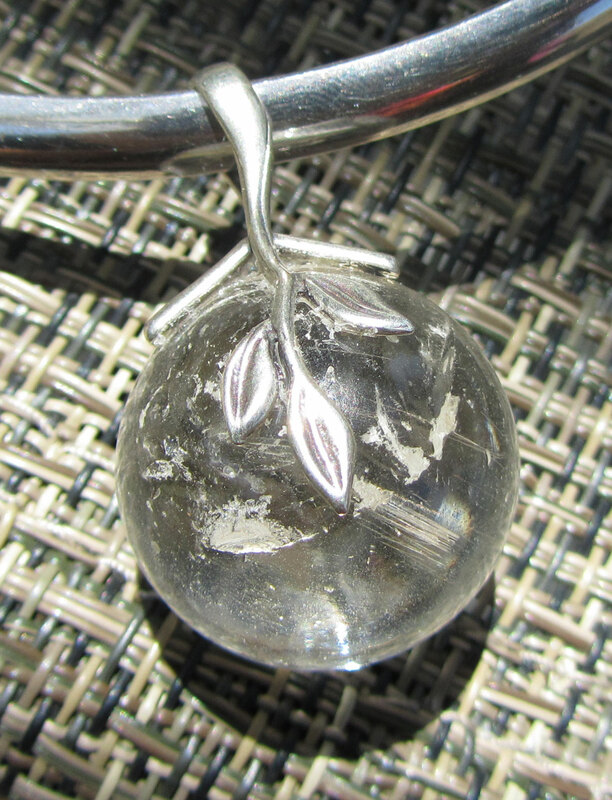 Only $33 + shipping, in order to help support this spreading of heart empowerment that they are actively seeding. The first, L.O.V.E. 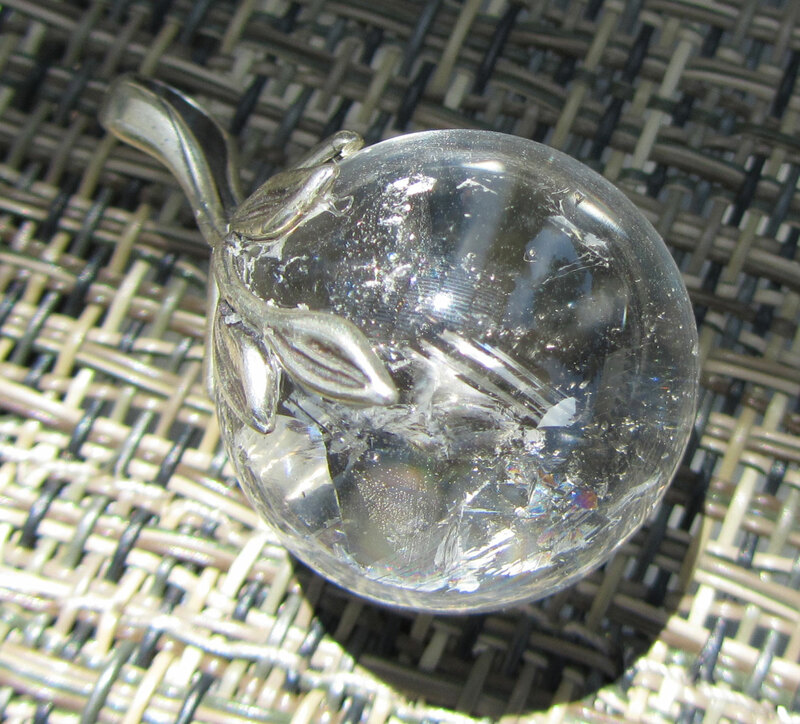 Seed #6, has a swirling galaxy that sits at front/top, with interesting lined filaments that then open into an almost clear sphere at bottom and back. 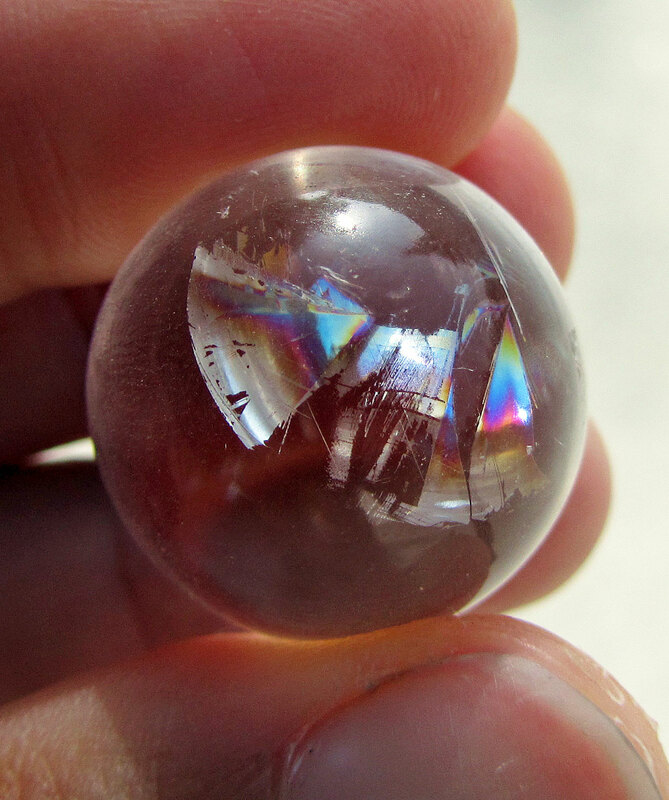 Sort of like concentrated crown chakra and third eye energy that then produces clarity when opened and traveled through. The second, L.O.V.E. 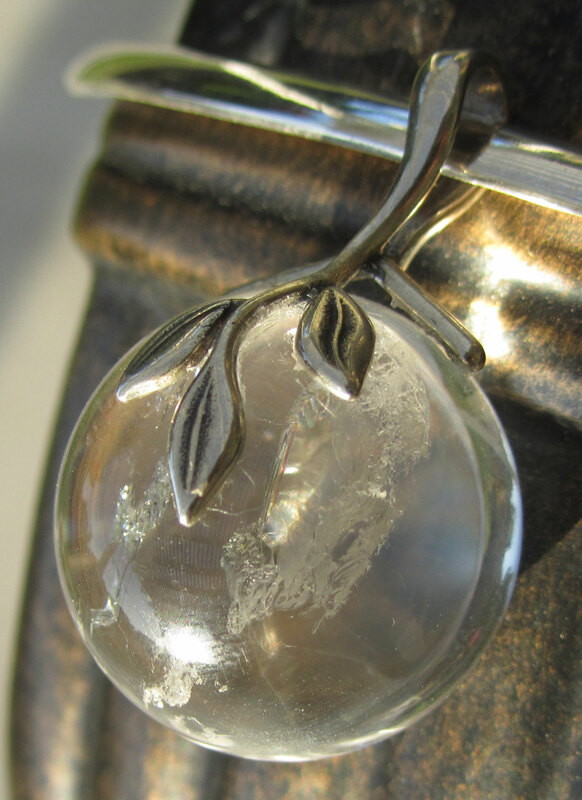 Seed #4, has such gorgeous merging and criss-crossing energy planes within that are feathery in movement and catch the light producing a dance of reflections. It has a very watery energy that begins clear at top, then starts to separate into crossing layers, floating above an abyss. Each and every one of these is SO unique and I know you will create an intimate relationship with them, as I have while working with them to prepare them. They mirror and reflect, each in their own way, the love that resides within. I receive a lot of inquiries and questions about tattoos and people wanting to receive advice or get my input and ideas on things. I end up spending a lot of time, as it is my desire to be of service and help people as much as possible. However, I can’t possibly continue to keep giving away my time, as I have services I need to be tending to and have to utilize my time and energy wisely for all of the new creations I am channeling and that have timing needs to get turned out by, as well as “actual” clients I do assist. So for those who would like assistance with zeroing in on the energy and specific design elements, placement, images, flow, etc. (for your sacred tattoo) that would be most resonating and supportive for your personal journey and what you are wanting to create in your life, I am now offering “solo” consultations via email (same as I did before with the sacred tattoo design process), but minus the actual design work. Of course, for those still wanting assistance with me actually designing the piece for you, I am still available to commission for this work at the same service rate as before: Sacred Tattoo Design. This service rate of $125/hour was for actual pencil to paper time and the consulting (usually done through extensive emails), research, meditation, and any extra goodies I infused into the process were added gifts to the very intensive journey. However, for those who still want the help, may not be able to manage the design service rate, but still want to ensure they are manifesting the perfect energy for their lives, you can now receive consulting support, which still includes the same process I offered before, minus the design work. After this month, the ebook – PDF version of Spiritual Skin will no longer be available. You will still be able to access it electronically via Kindle and get your own Paperback version on Amazon. VEGAN TATTOO FUN AND VIDEO TO COME! A couple of weeks ago Allison and I went in for a back-to-back “spiritual skin” tattoo session with LA’s vegan tattoo artist, James Spooner, who specializes in quality tattoos with no ethical compromise. Yes, he is the same James Spooner that directed the documentary film, Afro-Punk, that explores race identity in the punk scene. We love James! He is just a super cool, sweet, talented, eclectic, great energy, (and vegan!) guy! I met James at World Fest last year and had kept in contact since, watching the output of great work he was doing over the year. So when the timing presented itself, and Allison was game, it would be our turn to sample a little of his energy. Yay! I was there to just touch up and finalize my magical dragon (so, no, nothing new!) It was super cool, as not only had I never went with a friend to get a tattoo, or had company along the journey, but the highlight was being able to see in person one of my designs come to life on skin! I had designed Allison’s very first tattoo, which started out as a lovely wrist design, but as she shifted, became a gorgeous and powerful, large upper back and neck piece! I was so proud of her to say the least and James worked his skills with the design to add some of his own magical elements. A potent co-creative sacred tattoo! Even Allison’s husband, Chris, joined us later for the fun (his first time witnessing a tattoo session)! Firsts for everyone! We looked like we were camping out for the weekend, as we lugged in bags and backpacks full of vegan and raw vegan food and drink for the long day ahead (12:30 through 8:30pm). James is now at his own solo studio spot – Monocle Tattoo, a very cool one indeed, and we were excited to be some of his very first clients to visit the new studio. Was interesting timing, as it was just two days into my personal time off I took, unbeknownst to me I’d be taking it! We wanted to capture photos of the art in progress to be able to share and document, so we just shot what seemed like normal, random images (actually Allison and Chris did all the photography). But when she shared them with me today and I finally viewed the images taken, I was beside myself at what a comical array of images it was!! Or, at least it was to us! It was such a dichotomy of silly satire vs. the reality of intensity of the process. Anyway, will be sharing the images in a fun you-tube video montage soon. Allison still has a couple more sessions, so who knows what will be caught on film. I had no intention of sharing the images, but since they were so naturally candid and just us “being us,” I thought it would be great to share the process. 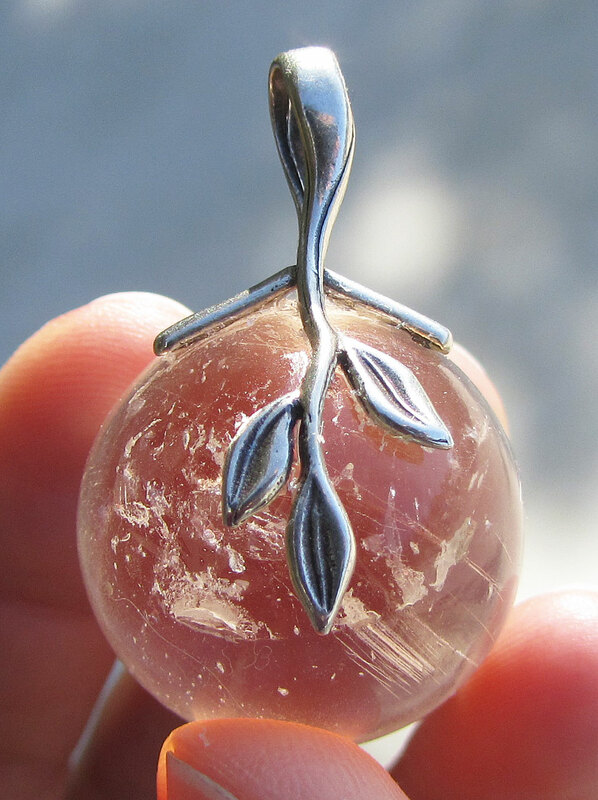 At ONLY $33 + shipping they are moving fast and that pleases me so, as I’ve been working with these little guys for quite some time and it’s obvious that their being so active now is in synch with divine planetary timing! There are only 4 left of the first family of 15 – #10, #6, #2 and #4 (please refer to their number if requesting a specific friend). I am posting photos of each of the 4 here for you to see which one may be calling, but most people have asked and enjoyed letting me intuit one for them. And of course, they receive Reiki infusing and are energetically charged up with little goodies for the individual they are going home with. Pre-orders are welcome for the next upcoming batch. 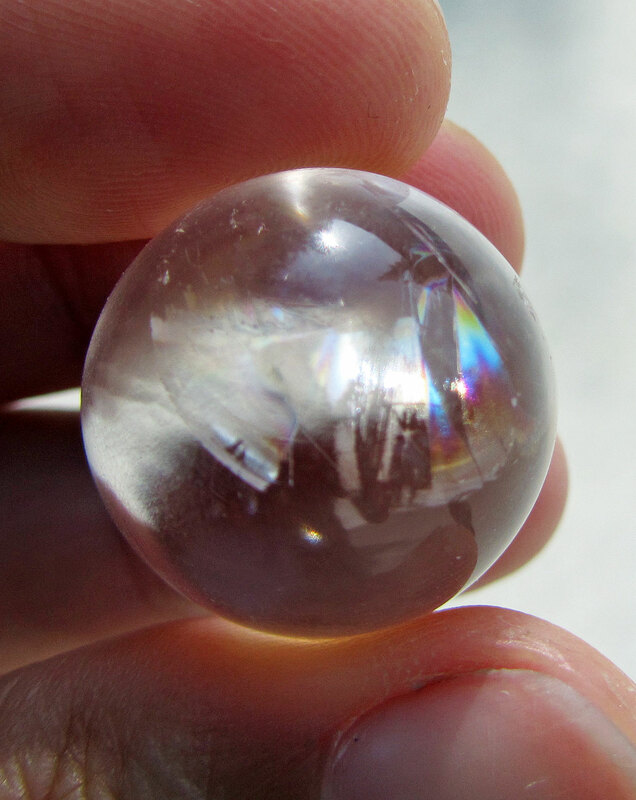 Each batch is a family unit – part of the total Lemurian collective family. All of these little L.O.V.E. 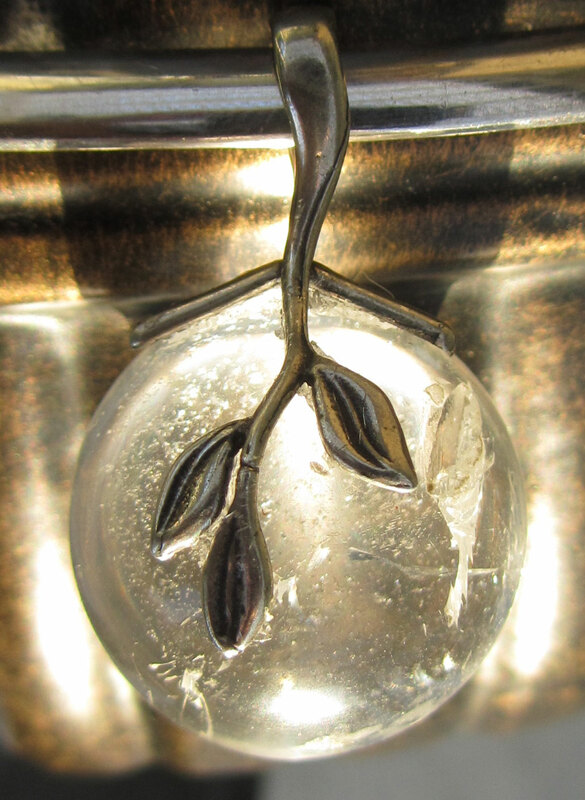 Seeds are absolutely stunning and hold very beautiful, powerful, yet gentle energy. 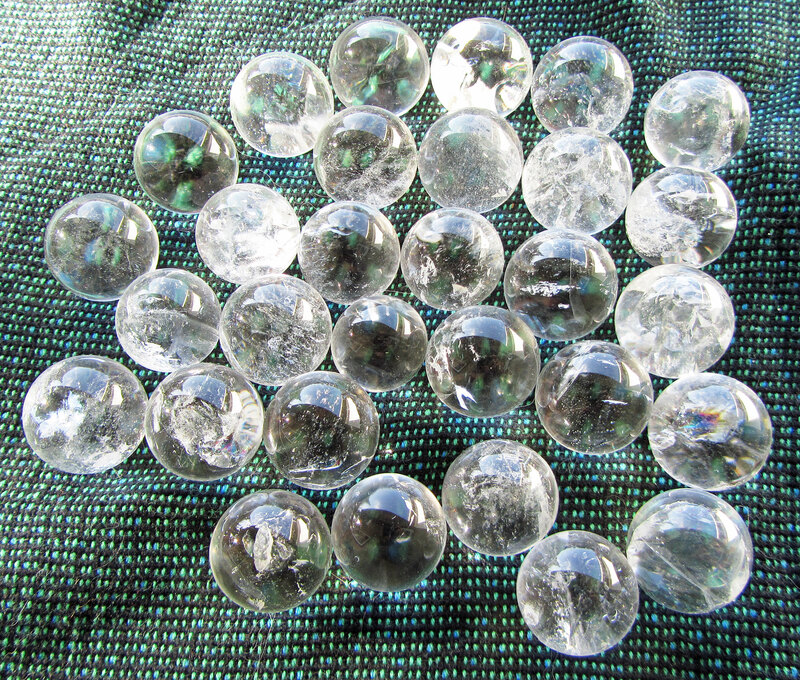 I’ve never seen such gorgeous little Lemurian spheres! And I’ve been receiving glowing testimonials from every person who has given a new home to these lovely beings. Hearing what people have to share really brings joy to my heart. I am so happy to be supporting their missions to “seed” love on Earth. L.O.V.E. 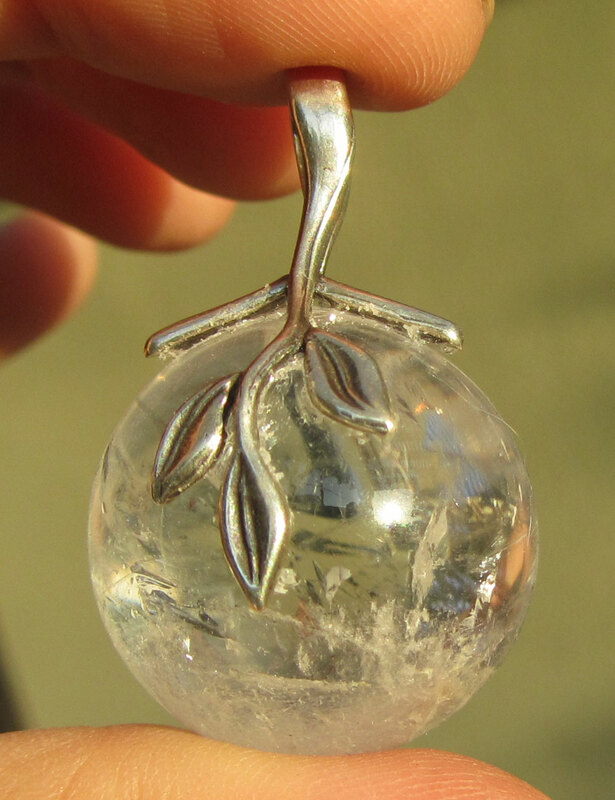 Seed pendants are special Lemurian Seed Crystal spheres created to help support us and the collective Earth as we enter a new paradigm. They are like fruits of the New Earth, seeding love in our blossoming hearts. 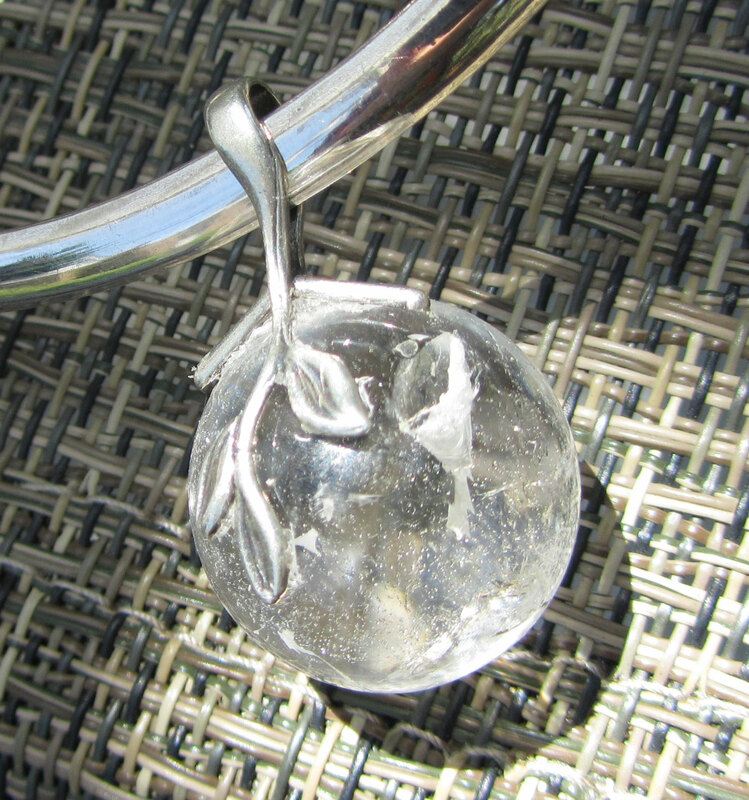 They are created with elegant long stemmed leaves (a favorite design among our Joyful Earth Crystal clients) made of pure 925 sterling silver. These come into our lives at this major time of human evolution and bring with them the necessary tools for us to shift to higher consciousness with understanding of all that has come before and all that lies ahead. 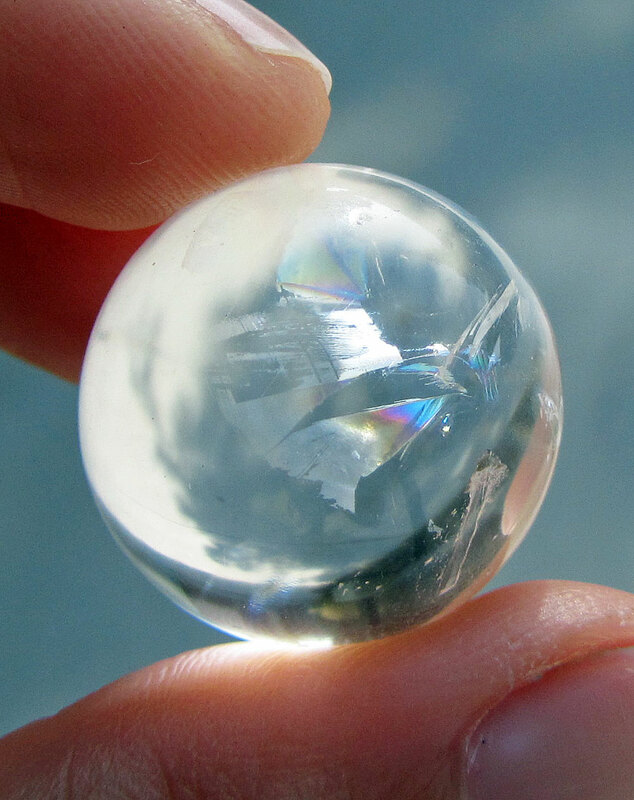 Lemurian Seed Crystals share with us the key energy of Lemuria, that of unity and love, in order to reactivate this ancient memory within the planetary matrix so that it may become the way of life on the New Earth. They are also a way to stay connected to the collective heart, while nurturing your own as a connective thread. Many may remember that I used to offer different types of supportive and intuitive services, but with shifts I needed to honor, I had to step back from several things I used to provide, even switching to requested private or group Reiki classes ONLY, rather than setting up designated class dates. I always change things up in ways that mirror where I am at, that are a most effective use of time and energy, and that mirror the collective needs. I’ve been observing the energy of things, previous to and even during my personal time off, and seeing nudges from those I’ve had in class and that I come in contact with on a regular basis, that point to my providing and offering a space of support for those who are really ready to rock and roll, as I am! I felt I should at least offer another option of my heart service for those who are stepping into their paths and needing that supportive insight to help them remain strongly on them and not give up, as these are pivotal times for not letting go of the dreams you’ve been working so hard for. For a limited time, to be determined by intuitive nudge, I will be offering “The Empowered Visionary” Email Support to aid co-creation of the New Earth that is birthing by empowering the visionary leaders. These are extremely potent times of rapid change from every angle and I want to be there as much as I can for other visionaries that are embracing the light of their authenticity, as I know how challenging it can be to keep strong and rooted in the creation of what may seem like ages you have been working towards. And I know that sometimes fresh perspectives, a little tweaking, small or big shifts, and even greater courage are needed, as well as know how those first steps can present new challenges, need reiterating support, could use the nurturing of a heart that understands, truly cares, and can provide insights. I’ve been receiving the nudge over and over recently that I should revisit offering support in a way that is conducive to the needs of others, the collective, and yet still honors and doesn’t diverge from my own path focuses. I have a sneaking feeling that this is leading to my own “next step,” as I seem to get the essence of a “future” outcome ahead of time and then need to hone in on the now in order to take the steps to get there. A quick back track to see how this fits in. 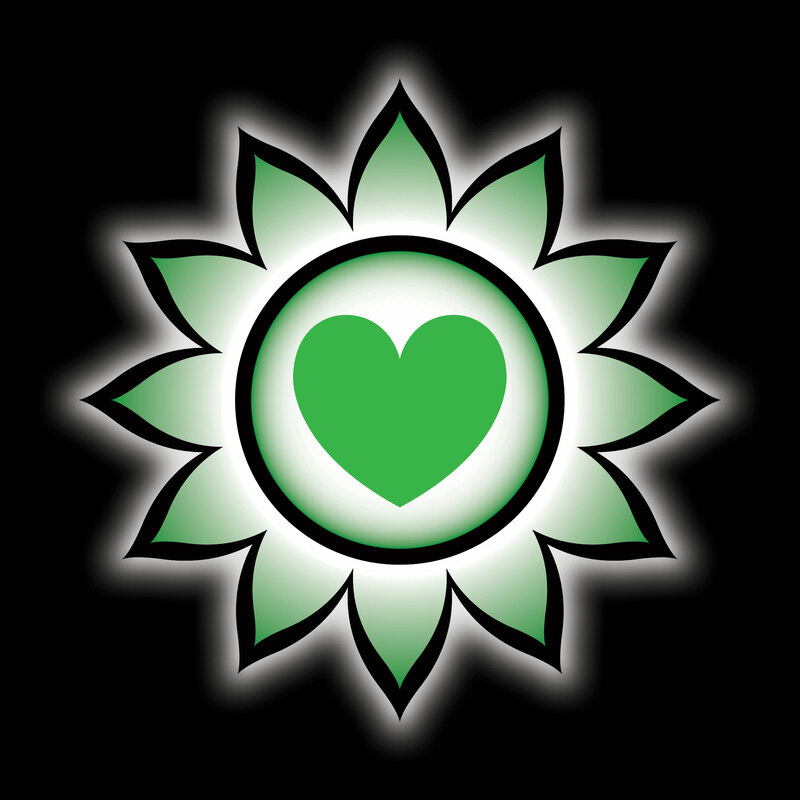 The journey of the heart was the inspiration behind creating Emerald Bridge – my compassionately conscious business that fuses visionary services and creations. Emerald Bridge reflects and embodies the divine and powerful essence of the Heart Chakra and its integrative, healing synergy. My hope for Emerald Bridge was to also inspire today’s visionaries of the world to empowered action, as I believe in the importance of cultivating authentic expressions of creative passion and actively manifesting visions into reality. As we each come fully into our light, we then help the collective light to shine more brightly. I have always been one to encourage myself and others to take courageous steps in following our heart’s joy, and to shift into new realities of experience. As a Reiki Master Teacher and Visionary of the Creative and Healing Arts, I have always naturally been one to help plant seeds, foster change, see from very different perspectives, provide supportive insight and help reveal hidden, sometimes hard-to-swallow truths. To inspire other visionaries in the world to find their authentic voice and discover their creative abundance, to help foster core heart courage and empowering love and joy – these are the pieces of my nature that used to be channeled unconsciously, but I’ve come to consciously embrace, over time, as an integral piece of my journey. What I’m offering is more about a partnership of support to help motivate, activate, empower, inspire, reveal, and kick start things into gear so that you can begin to share the joys and gifts of your heart as you were meant to – one visionary to another! Work co-creatively and co-supportively (the now energy): Together, we will work in “responsible” partnership to help you embrace your authenticity, reveal and work through fears, perceived limitations, enculturated and unconscious patterns, insecurities, doubts, frustrations and confusion that are holding you back. I provide a safe space to share and to explore – all in loving effort to help you courageously be you. I know what you are going through and I know how I have been able to shift the unwanted experiences to create more of what I do want to feel, so I can create what my heart wants and needs to share. I find email/writing to be a safe way and a way for people, myself included, to really let go and to flow with their thoughts – especially the creative and visionary minds. For me, writing is a way to process through things and much of the time, after I have written something out, the light bulb takes place. It just needed that committed, safe process to explore and allow energy to move. To have someone that can intuitively mirror, while holding that space for you, and that truly understands and can offer a resonating hand, can make a big difference. The email support I provide can be about exploring your fears, sharing your challenges, needing a sounding board, needing an understanding heart to help you know you aren’t alone, or insights to help you with your visions for your visionary focuses. The result will be helping you to reach your goals, find clarity, peace of mind, self-empowerment, build and discover your strengths and responsibility, create more conscious awareness, see from different perspectives, build your courage, find greater creative flow and exuberance, reach deeper into your creative imagination as the abundantly creative being that you are, and discover the realization of your ability to bring your visions into manifestation. A way to not only kick start the action you desire in your life, as well as revitalize the actions you have been taking, but you will also experience more magic in your life, experience more synchronicity, embrace deeper joy, find more balance and in essence experience being more in touch with your heart authenticity so that you can be the empowered, unique and beautiful visionary you are. This is a service I have been providing through every aspect of my work – sort of behind the scenes and in my daily contacts – from the sacred tattoo email consultations I provide to the Reiki classes, sessions and even writings, art, and crystal pendants I create. It naturally has taken place and in some cases is part of the process, but this is a way for those seeking the support to actually “commit” upfront to the process and to a responsible and empowering partnership, rather than side step the motivational drive that creatively may self sabotage, avoid, or even not consciously want to own up to the obvious desire that manifests by indirect interactions. I feel it is important to take responsibility in our lives and to embrace asking for help. There is strength in vulnerability, which I have discovered myself. It is also a time for supporting and creating with one another in loving ways, realizing that we are all connected and are all in this experience together. I am here to listen as your supportive friend, and fellow heart visionary, and honor and respect everything shared in complete confidentiality. How much do you value living with greater peace, courageous passion, and infectious inspiration? I know for me, it means everything to me, because I can’t provide the level of service I share with the world through my creations, if I don’t first have that experience and connection within myself. If you also desire to be of your highest potential and greatest service and good in the world, then it starts with you. Empowering other visionaries is important to me, as I see the difference it has made in my own life and how that trickles out to everyone I come in contact with. Every day I discover just how valuable that is for me and with every joy or pain filled step of my own process, I gain deeper gratitude for the daily miracles, that await my taking notice and I more deeply see the effects of every choice I make and how nothing is created that I haven’t chosen myself. If interested in beginning “The Empowered Visionary” Email Support, you may contact me at tania@taniamarie.com. This is not posted on my website, as I don’t know how long this will be in effect. So if you or someone you know is interested and stumbles upon or is looking for just what I’m offering, pass this along and send me a message so we can discuss where you’re at, and if this kind of support would be a good match that would benefit you. 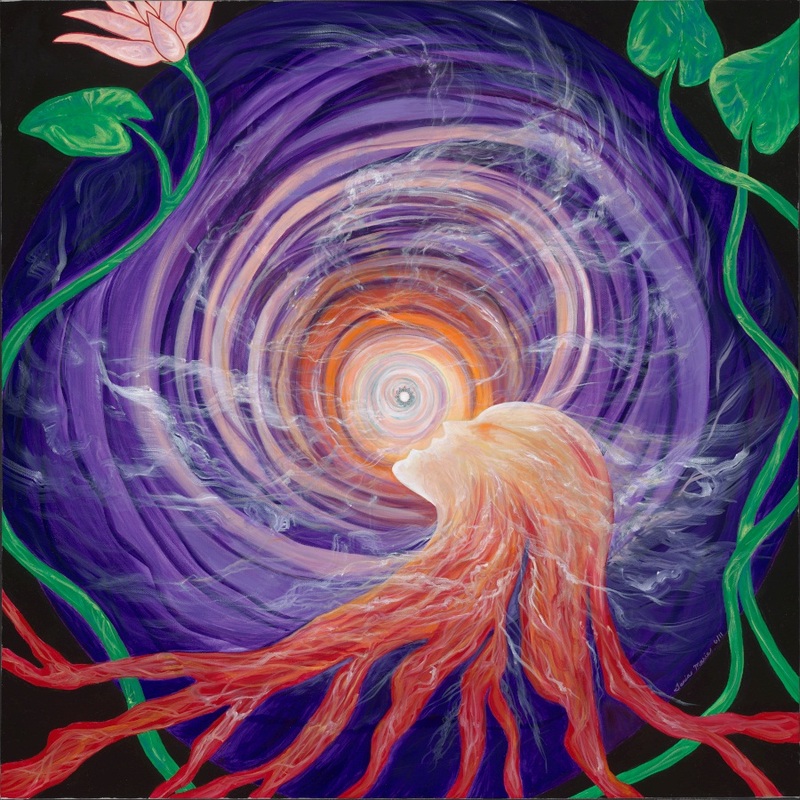 Portals, Rainbows and Dimensional Planes – Rediscovering Seeds of L.O.V.E. Feeling my seedling stardust, as a gentle, yet profound shift has rooted in my daily experience of life. This, since heeding the poignant messages that I was hit with of late. Coinciding and culminating between the 5-5-5 Full Moon and yesterday’s New Moon and Eclipse energies, my time of inner journeying has proven to provide fresh new perspectives, deeper sense of self, even wider vision and deeper heart levels. It seems others are also feeling/going through similar such experiences in their own way too, from what they have been sharing with me. Recap flash of two weeks ago, to the day: As I literally was hit while walking through a portal, I immediately got knocked into seeing from a different perspective, distorting any sense of knowingness I thought I had, into surrendering to the beingness this shift immediately was merging for me. In embracing greater flexibility I was transforming one structure, by weaving layers of dimensional webbing in a sort of wrinkle in time, into amorphous, experiential unity. (don’t ask me to explain where this explanation came from) 🙂 It is like a fractal experience of merging dimensional planes and rainbow effects that has taken place inside and out – so mirroring of my Lemurian friends I’ve been helping to place in new homes. It is as if my soul-planted seeds that once were experientially divided, are now merging. These seeds that have been growing on a parallel plane of existence I access at times, now are coming into consistent, unified experience. The blossom infused limbs have integrated through the veil, rather than existing separately as two different versions of my experience. Profound. As mentioned in yesterday’s post, it’s not so much a “newness,” as it is an activation of vulnerable authenticity and wholeness stepping forth into the light. It is like reconnecting with a long lost best friend – my inner child/natural essence of heart and soul – I used to play with in the shadows. As always, I am grateful for the alarm of my own inner clock’s wake up call – she never steers me wrong. And if at first I choose not to listen, embracing being shaken a bit with laughter, rather than anger, fear, confusion, or surprise, can make a huge difference still. After all, I am responsible for every choice I make and the creation of experience in direct effect. I am experiencing great sense of deep calm, peace, and transcendent stillness of something larger than words can encapsulate…so I’ll just leave it at that. 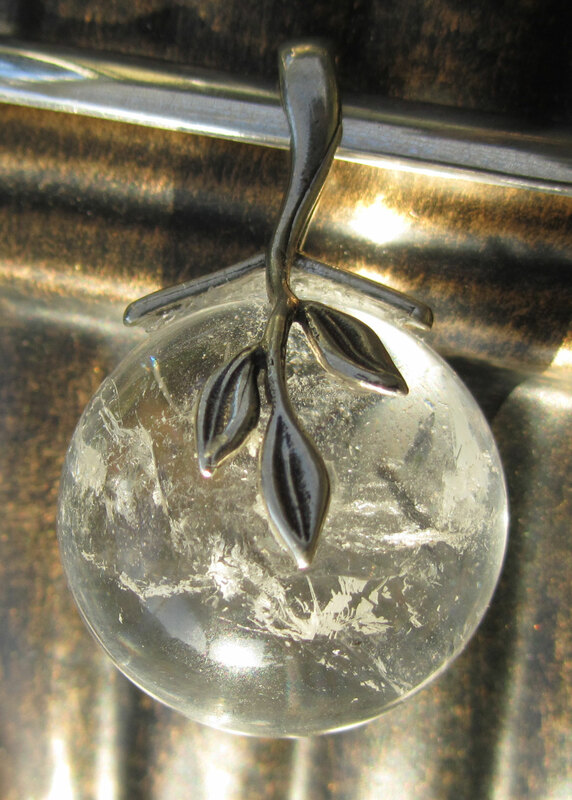 If you view yesterday’s post of new channeled creations, you will experience a glimpse into my heart seed that has merged into the light of now experience and continues to blossom in its new playground. Everything feels and looks different, but ever-more familiar. Seeing and creating through more integrated eyes, hands, and heart and more-so loving the little things that carry great meaning. These little Lemurians (especially # 11 shared) really demonstrate what I’m “trying” to communicate as my experience, simply by their natural “beingness” captured in photos. For those that have been inquiring and falling in love with these amazingly gorgeous beings, 2/3 of the newest batch of Seeds have lovingly been home placed. Only 6 remain from this collective family. I look at these remaining 6 and see (even more so) how each carries pollinating energy to activate the seeds within each of us. I do remember how when I was working with the 15 of them (only 13 of which are pictured here) for a few days, (precisely just before my personal incident leading to an inner journey) this energy greatly supported that kick start boost that created a huge shift and emergence for me of what I described above. I know both the power of these little ones with huge hearts and the power of “every” conscious choice and experience we make daily. I know not everyone believes same as I do, but I do know what my experience of life is like and that can’t be taken away or shaken out of me by outside disbelief – much of it boiling down to Love or Fear. Through our experiences, each of us comes to understand and know the value of remaining true to self and the importance of valuing self in every way. It not only empowers your personal experience, but collectively ripples. Every day brings greater clarity to the power of this for me and how it shifts every experience when depth of love resides within. As within, so without…..As above, so below. If you desire one of these remaining 6 Cosmic and Earth integrated L.O.V.E. Seeds, you can contact me to intuit one for you, or you can answer the calling of each I post, as they are ready to emerge. 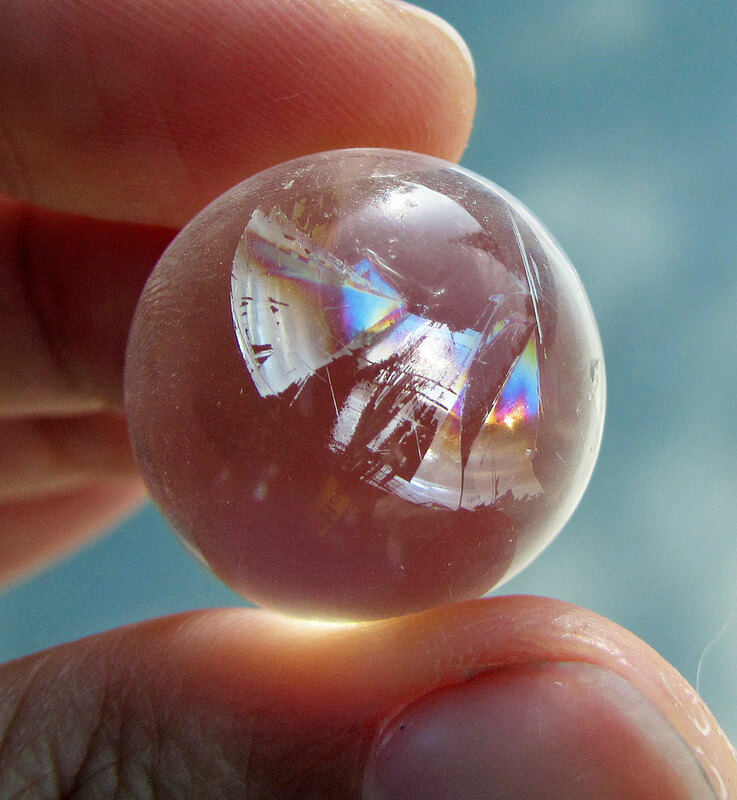 I have been overjoyed with the beautiful sharings from happy friendship unions between keeper and Lemurian L.O.V.E. 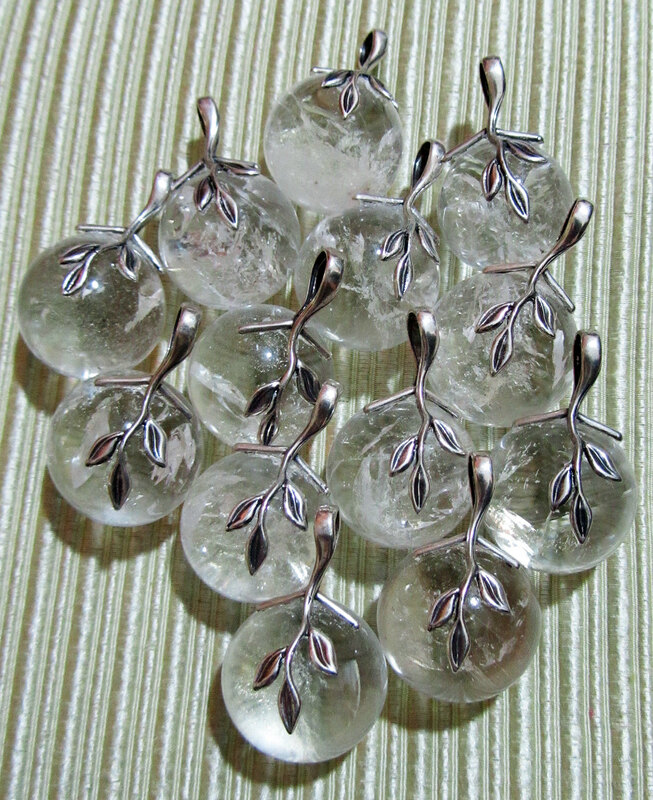 Seed spheres. Thank you to everyone who has written lovely testaments to the reason why I have answered the call to bring forth these little ones to help seed Love activations around the world.